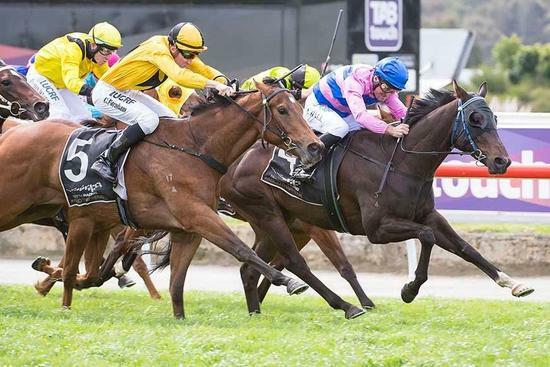 SJ Wolfe Racing three-year-old Arrum Boy (pictured thanks to Western Racepix) justified the stable's high opinion with an exciting victory in the $60,000 Fifth Leg Plate (Race 2-1200m) at Belmont today. The stylish son of Demerit was rated high enough as a two-year-old to have a crack at the Group 2 $500,000 Karrakatta Plate during the autumn and had raced competitively in four appearances this campaign, before showcasing his brilliant turn-of-foot to whiz past some talented opposition in the straight and hold on gamely when challenged late by Roganella to score by a short head. Ridden to perfection by long-time stable hoop Peter Hall, Arrum Boy accounted for the likes of city winners Resistance, Reykjavik and boom youngster Money Maher, and demonstrated that he has the weapons to match it with some of the best sprinting three-year-olds in the State. A fast-finishing third against some sharp customers over 1000 metres at Belmont last Saturday, Arrum Boy handled the seven-day back up and rise to 1200 metres like a true professional, and having been ridden for speed throughout his career, he's shown a liking for a more patient approach with his brilliant closing speed on display at his past two outings. It was a terrific result for all connections, as they not only got to share in the $36,000 winner's cheque but also a significant $30,000 Westspeed bonus payment, with Arrum Boy now having banked over $100,000 in stakes and bonuses from only eight starts.